The Florida football team went from a complete meltdown to closing strong. Let’s take a look at the Gators’ class of 2017 football players. Last week, the Florida football team lost its No. 2 commit and prized California pipeline product Elijah Blades to a decommit. Before that, it lost four-star Kai-Leon Herbert to Miami. After that, they thought all chances at C.J. Henderson and Brian Edwards were gone too. Then right after? It got worse. Less than 24 hours before signing day, Florida announced they would no longer “take” wide receiver James Robinson on scholarship. Well, we are here, and Florida finished as perfectly as it possibly could. Florida missed on a lot of kids, and there’s no doubt about that. They didn’t finish with Elijah Blades in the class and instead replaced him with three-star Donovan Stiner. Stiner is a quality take and get, but bluntly, he’s not better than Blades. Blades is a loss no matter what. Some of the losses also occurred before these last two weeks. Florida couldn’t close the deal on four-star Fred Hansard and lost two head-to-head battles to Alabama for five-stars Alex Leatherwood and Jerry Jeudy. All three of these losses were for different reasons, but a loss is a loss. Regardless, Florida’s class contained a lot of talent, and I’m not just saying that because they finished in the top 10. Florida signed kids who can play. Some of them lacked the rankings, but the film backed them up. Now let’s talk about Jim McElwain. Fans proclaimed he couldn’t get the board to buy in, couldn’t coach in tight games, and labeled him the worst atrocity on the planet on the recruiting trails. I even said he was bad recruiter myself, which I will own up too. Despite losing his No. 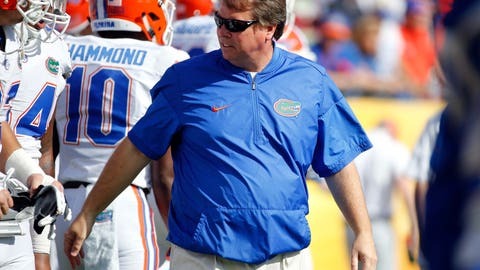 2 recruit, he took all of that to the bank this week, because Florida went from the No. 31 ranked recruiting class to No. 10. And let’s keep in mind, Florida was also short-staffed two position coaches and was already staff handicapped before the season. The last thing I would like to talk about with Coach Mac is giving a chance to both James Robinson and Adarius Lemons. Robinson, a four-star wide receiver out of Lakeland, Florida found himself in an awful station the past few days. He was cited for marijuana possession on his Ohio State visit, and he was the one who was thrown under the bus. Yesterday, he would find out the Florida administration would not allow Coach McElwain to take him into the program. Late on National Signing Day, that changed. As you can see in the tweet below, Robinson will be a Gator. The above is about more than football. It’s about giving a kid a chance and allowing him to make it out from where he’s from. That’s a stand-up move by McElwain. I know Robinson will pay him back. Lastly, as far as in-state, Florida finished behind FSU, but on top of Miami. The Gators only finished three spots behind FSU in the 247Sports Composite team rankings. It was clearly a wide margin, and they clearly have the better class for their needs, but think about how far UF has come. Florida only took one quarterback, but it was a quality get at a needed position. Jake Allen lost a star, but that means at some point, they saw four-star potential in him. Still, another talented kid with a good body at a needed position for UF on campus. This is a loaded class at running back and you can’t tell me otherwise. Both kids were three stars (Malik Davis and Adarius Lemons), but if you check the film, they both play like studs. The Gators only needed one quality back in this cycle with their already loaded backfield, but ended up taking two. Another position like running back that didn’t have any real needs, just luxury players. Luxury is what the Gators got with two four-star wideouts in Daquon Green and James Robinson. Both are beyond talented and will have great careers in Gainesville. Byrd isn’t official yet as he still hasn’t signed and faxed his LOI, likely for academic reasons. Gamble, on the other hand, is already on campus and looks to be a stud. It wouldn’t surprise me if Gamble were to have the starting job by conference play come this season. This is probably the position Florida missed the most at. They lost Kai Leon-Herbert to Miami, Alex Leatherwood to Alabama, and Navaughn Donaldson to Maimi. Regardless, the offensive line class was really solid to pair up with another one from last season. Telfort and Moore are both quality players. This is a position with something left to be desired, but the Gators still finished strong in the defensive trenches. From a DT board that was as scrambled and bad as possible a month ago, it filled out nicely on signing day. Florida probably could have used another defensive tackle, but it is what it is. Everyone here will see immediate playing time, especially Campbell, who is already on campus. On paper, easily the weakest position, but linebacker depth was needed more than day one-staters this cycle. When evaluating linebackers, we also have to keep in mind the Gators have Randy Shannon evaluating them. If Randy Shannon likes a kid, he’s most likely better than what he appears to be on the surface. I’m content with the four linebackers taken. I would have liked to see Levi Jones or Rahyme Johnson in the class, but it didn’t turn out like that. Man, let me tell you something. This defensive back class Florida has coming in is loaded—even without Elijah Blades. You’re talking about six kids, five of whom were Plan A options at major programs like Alabama, Miami, LSU, and USC, in one class. Don’t get me wrong, either; Stiner is a great talent, which is why he ended up at DBU. This whole set of defensive backs are studs. Florida football fans should be excited to see these kids in the swamp come September. No idea where he will actually play despite taking current reps at QB. Nonetheless, he’s a fantastic athlete with an elite skill set. Great asset.